For nearly half a century, the epicenter of excitement and glamour has been home to Luxaddi's corporate and design headquarters. Inspired by the true magic of light and its endless forms, Imagination light and decor opened its doors in 1968 and began a process of transformation. They transformed light into art and revolutionized modern light design and home decor. 'Luxaddi' was born out of designers and craftsmen who collaborated to create infinitely beautiful and classic lighting fixture pieces of unsurpassed style. Each design has a spirit of creation that unveils the magic of light, making every corner of your home beautifully unique. Lighting up Tomorrow Not just decorative lighting solutions for today but Luxaddi also aims at staying ahead of times and creating future benchmarks. 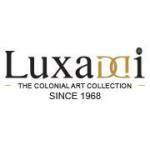 While Abhishek rightfully says, "Change is the only constant … evolution is the means to stay ahead of the times”, Luxaddi is still ardently loyal to the historical roots and has been delivering colonial and heritage lighting with superior brass work to palaces, 5 star hotels and private residences. It is the dedication and passion of the craftsmen and artists who turn raw material into beautiful lighting solutions. No two pieces are alike, since each one is handmade and unique. Be it a neoclassical chandelier, a blown glass table lamp or a rococo style wall light, each one imbibes the beauty and spirit of its inspiration. People and artisans Our biggest asset is our craftsmen and metal workers who bring with them age-old techniques in intricate brass works, blown glass, and polishing and finishing. Each piece is an outcome of close collaboration, years of knowledge and understanding this craft right from inception.